Epiphone is proud to present the new Ltd. Ed. Slash "Rosso Corsa" Les Paul Standard Outfit featuring Slash’s personally designed Seymour Duncan™ Slash Alnico II Pro Humbucker pickups in a classic Les Paul customized with a “Rosso Corsa” racing red finish, Sprague "Orange Drop" Capacitors, a personalized Slash neck design, and a custom hard case with a Certificate of Authenticity. Slash is one of Epiphone’s premier signature artists and a member of the Rock and Roll Hall of Fame for his iconic guitar solos in Guns N’ Roses. 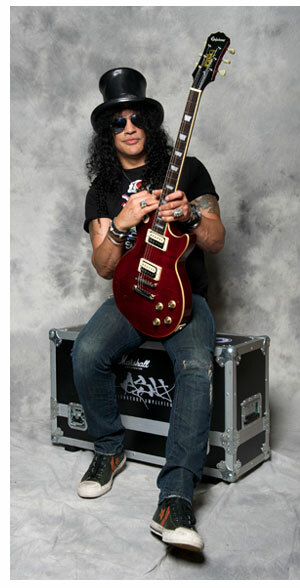 Slash is known around the world as the ultimate Les Paul player. And like Epiphone, Slash is on a mission to make superb, affordable and professional instruments available to everyone throughout the world. Now, the Epiphone Ltd. Ed. Slash "Rosso Corsa" Les Paul Standard Outfit puts Slash’s classic tone in the hands of players of all levels in one of the most unique and beautiful Les Paul ever made. Like all Epiphones, the Ltd. Ed. Slash "Rosso Corsa" Les Paul Standard Outfit comes with Epiphone’s Limited Lifetime Warranty and Gibson Brands 24/7/365 Customer Service. Over the last decade, Slash has chosen Epiphone as his #1 partner for creating affordable and great sounding pro instruments. Now, Slash’s own favorite “Rosso Corsa” Les Paul is available to anyone around the world who wants to play a great Epiphone Les Paul. And who doesn’t want to play a great Les Paul? Play one today at your Authorized Epiphone Dealer. Slash himself helped design Epiphone’s new "Rosso Corsa" Les Paul Standard based on his own custom Les Paul, which serves as his main axe in the studio and on stage with his band the Conspirators. The top has a carved Hard Maple cap with a AAA Flame Maple Veneer finished in Rosso Corsa, the unique hand-tinted finish that you can only find with Slash-made Epiphone and Gibson Brand Les Pauls. The Hard Maple cap (or “top”) gives Slash’s Les Paul Standard additional bite and articulation while the mahogany back is treated with Gibson-style weight relief for comfort and better resonance for a superstar-quality Les Paul. The top and neck has single layer Ivory colored binding just like Slash’s original. 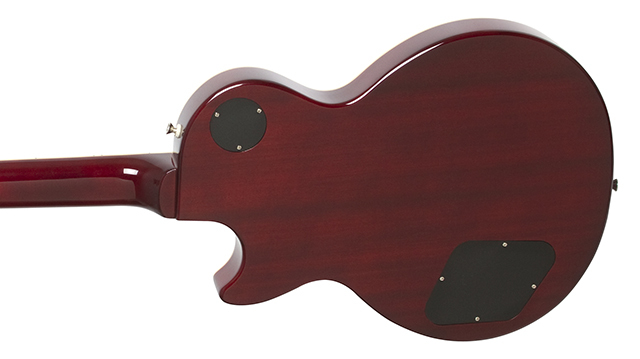 And to avoid concealing any of the Rosso Corsa finish, the guitar’s pickguard is in the case, not on the Les Paul! The Mahogany neck is modeled on Slash’s personal Les Paul and has a SlimTaper™ D profile with a Les Paul’s classic 24.75” scale, a 12” radius, and a 1.68” nut. The fingerboard has medium jumbo frets and pearloid "Trapezoid" inlays. The Sloped Dovewing headstock has a distinctive Slash “Snakepit” logo in gold silk print on the headstock as well as the custom hard case. The Ltd. Ed. Slash "Rosso Corsa” includes one of Slash’s favorite custom pickups, a Seymour Duncan™ Slash Alnico II Pro Humbucker with a “Reverse Zebra” in the bridge and a Seymour Duncan™ Slash Alnico II Pro Humbucker “Zebra” in the neck—both with no logo. The “Slash” Seymour Duncan pickups offer a twist on the famous (and for most unattainable) original “PAF” hand wound humbuckers from the late 50s. Slash helped design the pickups with Seymour Duncan himself based on his favorite vintage Les Pauls. Seymour Duncan was one of the first custom pickup designers and has repaired, rewound, and studied 100s of vintage Les Pauls from the late 50s including all of Slash’s vintage collection. Each pickup is wired to high quality volume controls with Sprague "Orange Drop" Capacitors on each pickup’s gold top hat tone control knobs. The Rosso Corsa’s electronics also include Epiphone’s all-metal 3-way toggle and all-metal output jack. Slash’s long association with Epiphone speaks volumes about his faith in Epiphone electronics, design quality, and super tough hardware. The Ltd. Ed. 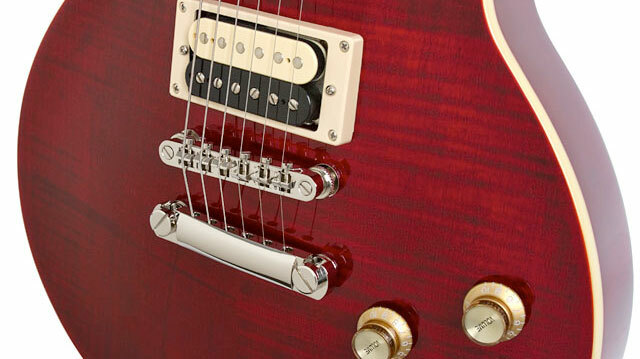 “Rosso Corsa” includes Epi’s LockTone™ Tune-o-matic bridge and Stopbar tailpiece for solid intonation. 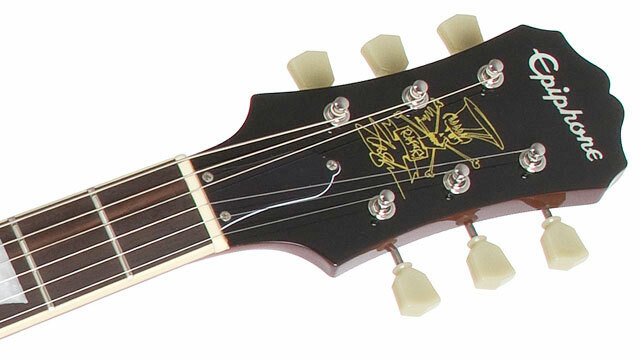 And tuning is quick, intuitive and stable with Epiphone "Deluxe" with "tulip" buttons 14:1 ratio machine heads.